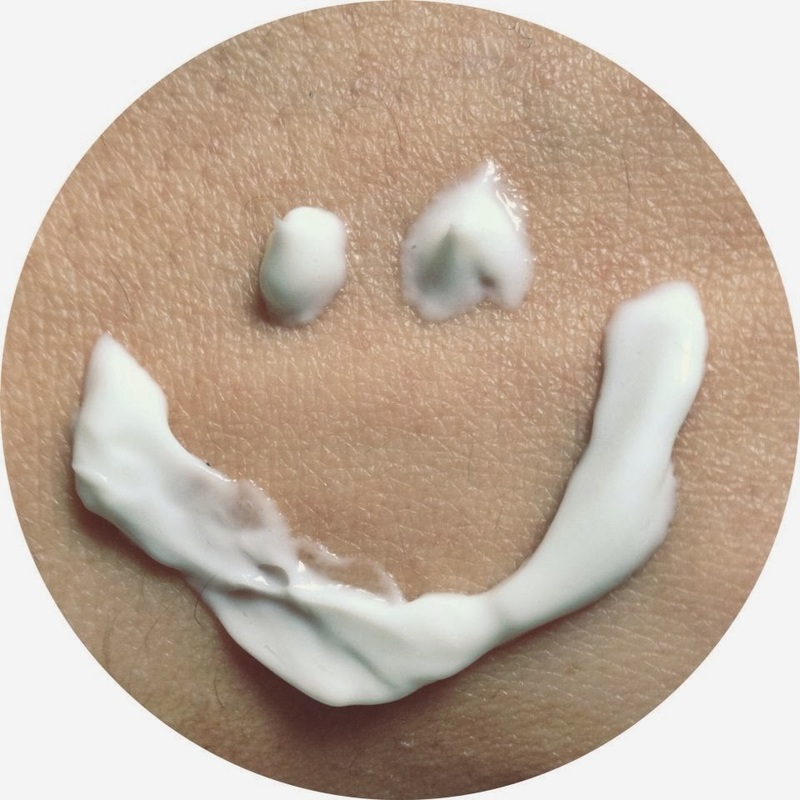 I am really super excited for this product review and giveaway for a number of reasons. I love trying new things and getting free stuff in the mail and people caring about my opinions is stellar...because in real life no one ever cares. In aforementioned post, I also mentioned that my flesh was literally breaking apart like magic shell, thus leaving me desperate for some sort of moisturization intervention. These products were made by one of my oldest friends and his lovely wife. Garrett and I have known each other since we were about 8 or 9. We grew up together at a camp for kids with MD and have stayed in touch all the way. In the last few years, he and his lovely wife Katie have built a life together in Sparta, TN where they use their land to grow all kinds of organic fruits and veggies and raise goats. [Tangent: Hanging out with goats all day makes me insanely jealous!] I am always very envious of people so resourceful and able to live off the land as he and Katie are. 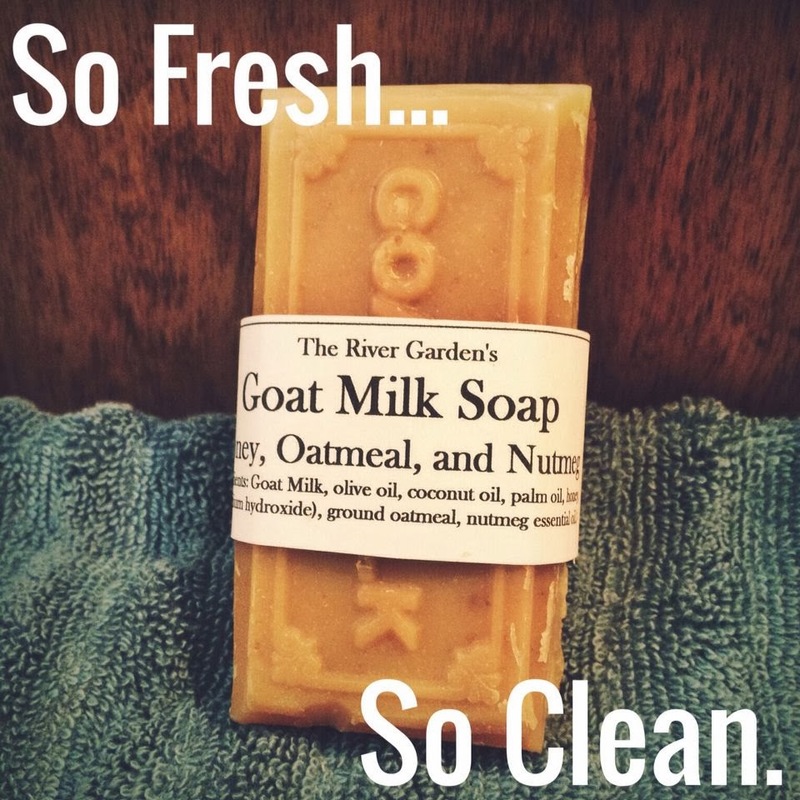 Since 2010 they have sold their wares at farmer's markets and co-ops, but are now taking their line of natural and organic goat's milk skincare to the internet. [Tangent: You can check out their facebook page here and their online store here. As you can see, the price point is incredibly affordable. $4.50!?!?!? Are you kidding me?!?! Have you seen how much Green Hills ladies spend for "organic goods?" That's my kind of prices! ] I'm so proud of them and excited to share them and their labor of love with you all. When I opened the package from them, I was kind of overwhelmed with the scent of the honey, oatmeal and nutmeg soap. [Tangent: I had no idea which items they were sending me, but was really excited when I saw this is what they selected. When something is overly perfumey, I generally get turned off imediately.] It smelled so good and herbally that I was more or less huffing it. Jamie liked it, too, so I can confirm that it is pretty unisex. 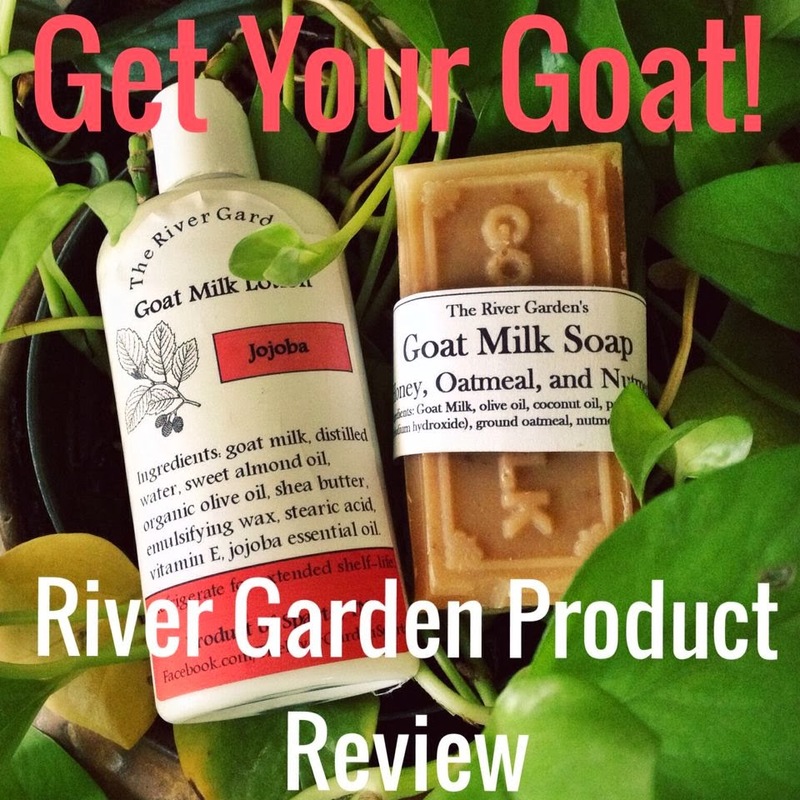 The River Garden uses all essentially oils and natural ingredients to scent their products and no artificial fragrance oils, for those with those kinds of allergies and sensitivities. The idea of traditional bar soap used to freak me out until the last year when I started religiously using one by another company. [Tangent: I don't now why, but bar soap always made me feel super masculine...as if girls shouldn't use bar soap. I know that is utterly ridiculous. Luckily, I have gotten over this prejudice.] Plus, these bars are locally produced and 100% paraben free...and not to mention that I can pronounce everything on the label. After scrubbing down with the soap, my skin was clean...as in it was literally squeaky with cleanliness! Because my skin is clinically dry, I think I will use it every other shower during the winter months, but once warmer months kick in, I think I will use it with more regularity. IT SMELLS SO GOOD! 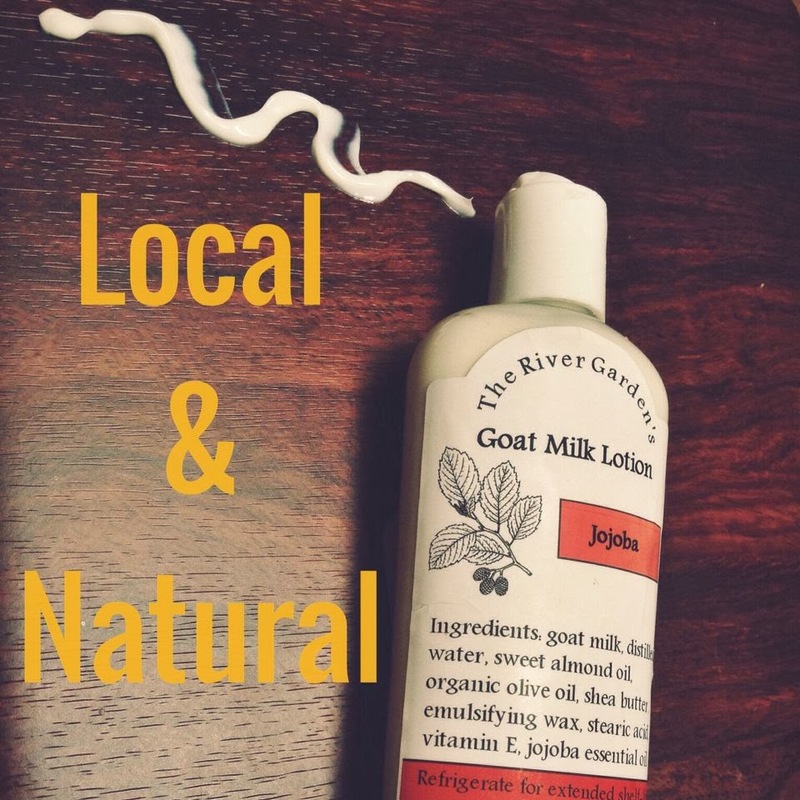 To quench my thirsty skin, I was extremely eager to lube up with the Jojoba goat milk lotion. They have informed me this variety would be the best for my dry skin. Because I truly love these guys and wish the best for The River Garden, I want to share a piece of it with you. One lucky reader will win a prize pack with a soap and lotion of their very own! Also The River Garden is giving all of my readers a 10% discount off of their already low prices. Use coupon code: THATGIRL for 10% off!! Enter below! Winner will be announced one week from today (2/16)! Good luck, guys, and thanks for helping me support awesome local businesses! I love me some organic, locally-made products! Glad you found something to soothe your alligator skin, Jones. I love natural products like this. Local business? What could be better?! The soap smells so good. I seriously wish that my blog was scratch and sniff. As an Oregon girl, I should have all kinds of organic products to brag about, but.... I'm not coming up with much. I loves me some organic apple juice, though! The regular stuff never tastes as good again! I'm so late to the game on all this stuff...and I am totally not a snob about it. I still use products that are probably loaded with all sorts of bad for me stuff, but I am trying to be slightly more conscious. Baby steps. So I have a sort of unhealthy obsession with goats because they're adorable and share your jealousy because my co-workers don't bleat. Even though I think they use some of the goats for meat...so I don't know how attached I could be. Life is all about balance, right? Yeah, I eat complete junk most of the time and am not above crappy toxin filled products, but I like to integrate in some "good for me" stuff. You absolutely should! They are great people. If you try one besides the Jojoba, I would love to know what you think. I'll try anything once! I take a lot of medicine that dehydrates me so I'd love to find a good line of natural products that will keep my skin healthy.